"This recipe is easy enough for anyone to make and can be customized by using your favorite barbeque sauce." Combine pork strips, cumin, and garlic pepper blend in a large resealable plastic bag. Shake until pork is coated. Heat vegetable oil in a large skillet over medium heat. Add pork; cook and stir until browned, 4 to 5 minutes. Add onion, red bell pepper, and green bell pepper; cook until fragrant, about 2 minutes. Stir in barbeque sauce; simmer until flavors combine, about 2 minutes. 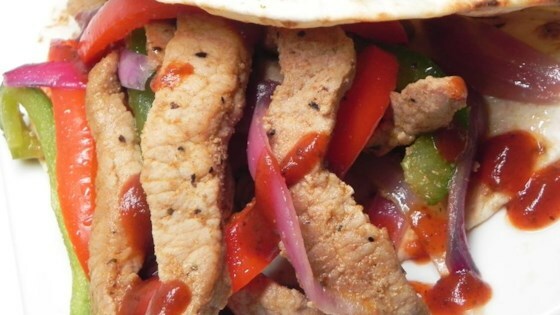 Serve pork mixture over flour tortillas. Substitute taco seasoning for the ground cumin if desired.